An antidote to perverse pricing. PATRICK LECLEZIO identifies five whiskies vying hardest for value. It’s easy to get carried away by whisky fever. I know because I’m particularly susceptible; I’ll wax lyrical at any given opportunity, and I’ll clamour for the fancy stuff. There is a plethora of great candidates with much to be recommended. In fact whisky as a whole just lends itself to this enthusiasm. The flavours are varied and interesting, and have struck a chord with a multitude of drinkers. The stories equally are compelling: rich histories, beautiful settings, and colourful characters weave an engaging narrative. And the industry is highly capable, having carefully cultivated and exploited these attributes. It’s no surprise then that people tend to get passionate about this drink. In my circles I’m often talking up all sorts of fine whiskies – usually the type that comes with an increasingly hefty price tag. Do they warrant their cost overall, or has the market been hypnotised by the hype? I could make the case that whisky is just a beverage. You drink it and then it’s gone. Are we paying the appropriate premium for perceived increments in quality? It’s a difficult, objectively almost unresolvable, question – but I made a broader associated realisation recently. Over the years I’ve gradually passed over the cheaper-end whiskies in my bar, subconsciously assuming that I’ll get better satisfaction from the more expensive stuff. I needed a reality check, so I challenged myself to seek out five whiskies each costing under R500 that I could casually drink with equivalent fulfilment as my top-shelf selection (or even more fulfilment – because who doesn’t appreciate getting the same for less). Here they are in no particular order. Straight bourbon is probably the most tightly regulated of all spirits. This situation has its positives and negatives. Amongst the latter is the narrow band of flavour to which it is inevitably consigned, although lately, encouragingly, this has been levered wider by some innovative product initiatives. But these can only go so far. More exciting still is the introduction of a spate of drinks that are straight bourbon (in spirit, no pun intended), but not straight bourbon (according to the letter of the law) i.e. they usually start off as a straight bourbon, but then diverge in one way or another. You’ll be able to identify these by their labelling, which typically reads “Kentucky Straight Bourbon…” addended with a qualifier of some sort. Maker’s 46 is one of these. It is effectively the same liquid from the standard-bearing Maker’s Mark, but aged for a bit longer, during which time seared French oak staves (the divergence / qualifier) have been introduced into the barrel. The result is a full-flavoured, hot-cross-bun of a bourbon. There’s vanilla, toffee and biscuits here, all expected in a wheated bourbon, but I was surprised by the prominent spice, from the staves I’m guessing , and by the thick depth of the flavour: this is one heck of rich whisky. Maker’s 46 just squeaks into the budget, but it nails my approval by a wide margin. Whilst I’ve sort of lost track of it over the years the 12YO Dewar’s had always been a personal favourite. Nothing seems to have changed. Dewar’s was a pioneer of “marrying” – the process during which whisky stands and settles for a few months after blending or vatting. There are other influences of course, but this is likely a contributing factor to its extraordinary balance. These components have clearly all got to know and like each other. There isn’t a single argument, and there are no underlying tensions. All the flavours work together in perfect, contented harmony within and across the nose, palate and finish. The glorious, integrated array of fruit, cereal, spice, honey and oak in the 12YO will not disappoint, and the 15YO does it again with some added complexity. You’ll be hard pressed to find better blended Scotch all-rounders at these price points. Sadly they’re a bit sparse in South Africa compared to some of their peers, but it’s worth hunting around until you find them. If I played golf this would be my hole-in-one drink. I’d want the celebration to be unreservedly enjoyable, I’m picturing a chorus of clicking glasses and vibrant camaraderie, but without excessively punishing my pocket. Black Bush is the ideal catalyst for this outcome, and indeed many other wonderful occasions. What it promises on paper: high malt content, predominant Oloroso cask ageing, significant maturation, it delivers emphatically in its full-bodied person: an intense out-of-the-park flavour that is husky, fruity, and spicy, with a masculine background of leather and perhaps tobacco. If I had to plot the broader continuum of whisky pricing versus performance, definitely featuring a quadrant I’d label “perverse”, Black Bush would dominate the opposite position, at the head of the “charity” quadrant; for what it is they’re almost giving this stuff away. An enduring classic. I’ve never had a glass of Black Bush in which I didn’t delight. I’ll allow myself to stand corrected but I think Monkey Shoulder is the only whisky named after an injury – one sustained by distillery workers whilst shifting barley with shiels on a malting floor. It’s the type of quirkiness that defines this young, fun, monkey-mischievous whisky. In days past it might have been called a triple malt, with its parts originating from three malt distilleries: Kininvie, Glenfiddich, and The Balvenie, but today it is known as a blended malt – a sadly underrepresented style, those with such clearly identifiable provenance even more so. For this reason alone, that it’s one of few representatives, it’s a whisky worth noting. That it’s also smooth, approachable, uncomplicated, and reasonably priced – an ideal introduction to malt whisky drinking, but with enough range of flavour, especially for what is ostensibly a young whisky, to keep the more seasoned interested – puts it over the top and into my group of hard-hitting stars. Last year was bursting at the whisky seams. PATRICK LECLEZIO recapitulates the major new appearances during 2013. First published in Prestige Magazine (February 2014 edition). The soaring popularity of whisky in the recent past (and ongoing I should add) is well documented. We are living through a period where more whisky is being produced and consumed than at any other time in history. I’d hesitate to describe it as a “golden age” – defined by the Oxford, specific to our purposes, as “the period when a specified art or activity is at its peak” and, more generally, as “an idyllic, often imaginary past time of peace, prosperity, and happiness” – because peaks in volume do not necessarily (and in fact often don’t) coincide with peaks in quality, and any idealisation of our whisky era by future generations may well be somewhat imaginary, but it is undoubtedly a remarkable and an interesting time, as epitomised by the action in 2013. We experienced a glut of new releases on the South African market at a variety of price points, so there was something relevant for any and every whisky lover. In case you missed it, here are the highlights. May the dram be with you! (A bit of background on the review – all the whiskies featured were evaluated by a panel of four whiskyphiles during the course of a single evening). This high-intrigue launch created considerable anticipation as the marketing machine of the world’s second-biggest single malt shifted into high gear. I must admit that my interest was piqued. Here was a whisky with a cask profile that is completely unique (to the best of my knowledge): the Alpha has been matured in first-fill casks seasoned with Scotch whisky, instead of the typical Bourbon or Sherry i.e. the Alpha’s casks were virgins when they were first used to age Scotch whisky. If you’ve been around the block and you’re struggling to find something genuinely different then I reckon this is worth trying for that reason alone. Hats off to them for a bit of sparkling innovation. But whilst it may yet give rise to illustrious progeny this first effort was be middle-of-the-road – a touch disappointing, given the expectations, and, dare I say it, a touch immature-tasting for the price point. I think I need to revisit it in a quieter moment. It may be lower profile and less newsworthy than the Alpha, and whilst it may not boast the same uniqueness this whisky is nonetheless unusual. 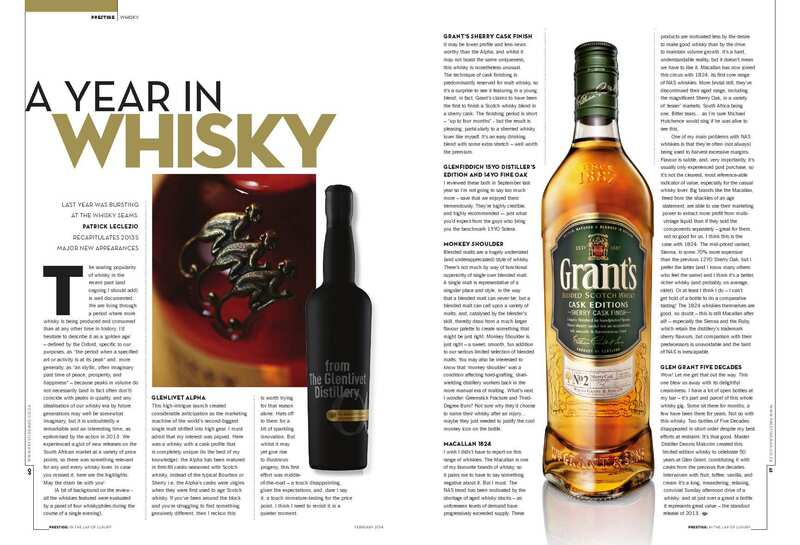 The technique of cask finishing is predominantly reserved for malt whisky, so it’s a surprise to see it featuring in a young blend; in fact Grant’s claims to have been the first to finish a Scotch whisky blend in a sherry cask. The finishing period is short – “up to four months” – but the result is pleasing, particularly to a sherried whisky lover like myself. It’s an easy drinking blend with some extra stretch – well worth the premium. I reviewed these both in September last year so I’m not going to say too much more – save that we enjoyed them tremendously. They’re highly credible, and highly recommended – just what you’d expect from the guys who bring you the benchmark 15YO Solera. Blended malts are a hugely underrated (and underappreciated) style of whisky. There’s not much by way of functional superiority of single over blended malt. A single malt is representative of a singular place and style, in the way that a blended malt can never be, but a blended malt can call upon a variety of malts, and, catalysed by the blender’s skill, thereby draw from a much larger flavour palette to create something that might be just right. Monkey Shoulder is just right – a sweet, smooth, fun addition to our serious limited selection of blended malts. You may also be interested to know that “monkey shoulder” was a condition affecting hard-grafting, shiel-wielding distillery workers back in the more manual era of malting. What’s next I wonder: Greenstick Fracture and Third-Degree Burn? Not sure why they’d choose to name their whisky after an injury…maybe they just needed to justify the cool monkey icon on the bottle. I wish I didn’t have to report on this range of whiskies. The Macallan is one of my favourite brands of whisky, so it pains me to have to say something negative about it. But unfortunately I must. The NAS trend has been motivated by the shortage of aged whisky stocks – as unforeseen levels of demand have progressively exceeded supply. These products are motivated less by the desire to make good whisky than by the drive to maintain volume growth. It’s a hard, understandable reality, but it doesn’t mean we have to like it. Macallan has now joined this circus with 1824, its first core range of NAS whiskies. More brutal still, they’ve discontinued their aged range, including the magnificent Sherry Oak, in a variety of “lesser” markets, South Africa being one. Bitter tears…as I’m sure Michael Hutchence would sing if he was alive to see this. One of my main problems with NAS whiskies is that they’re often (not always) being used to harvest excessive margins. Flavour is subtle, and, very importantly, it’s usually only experienced post purchase, so it’s not the clearest, most reference-able indicator of value, especially for the casual whisky lover. Big brands like the Macallan, freed from the shackles of an age statement, are able to use their marketing power to extract more profit from multi-vintage liquid than if they sold the components separately – great for them, not so good for us. I think this is the case with 1824. The mid-priced variant, Sienna, is some 70% more expensive than the previous 12YO Sherry Oak, but I prefer the latter (and I know many others who feel the same) and I think it’s a better, richer whisky (and probably on average older). Or at least I think I do – I can’t get hold of a bottle to do a comparative tasting! The 1824 whiskies themselves are good, no doubt – this is still Macallan after all! – especially the Sienna and the Ruby which retain the distillery’s trademark sherry flavours, but comparison with their predecessors is unavoidable and the taint of NAS is inescapable. Wow! Let me get that out the way. This one blew us away with its delightful creaminess. I have a lot of open bottles at my bar – it’s part and parcel of this whole whisky gig. Some sit there for months, a few have been there for years. Not so with this whisky. Two bottles of Five Decades disappeared in short order despite my best efforts at restraint. It’s that good. Master Distiller Dennis Malcolm created this limited edition whisky to celebrate 50 years at Glen Grant, constituting it with casks from the previous five decades. Interwoven with fruit, toffee, vanilla, and cream it’s a long, meandering, relaxing, convivial Sunday afternoon drive of a whisky; and at just over a grand a bottle it represents great value – the standout release of 2013.